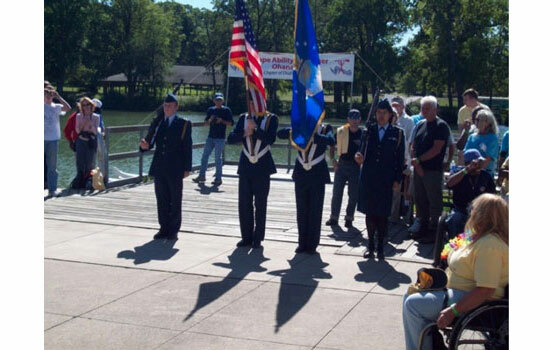 The RIT Air Force ROTC Cadet Honor Guard Team presented the American Flag in a ceremony honoring disabled veterans from the current conflicts in Iraq and Afghanistan. Cadets from Air Force ROTC Detachment 538 at RIT co-hosted the 13th Annual Rochester River Challenge Outrigger Canoe Sprint Races this fall. The event, a Wounded Warrior-Disabled Sports Event, took place at the Genesee Valley Park Complex. The cadets from RIT, in addition to helping set up the event with co-hosts Cape Ability Outrigger Ohana, also participated in two outrigger canoe races. Outriggers are 30-foot, double-hull Hawaiian canoes. Teams participate in a series of 400-meter sprint races. The RIT cadet team posted the third fastest time of the day. All proceeds from the event go to support programs and events for local disabled veterans.